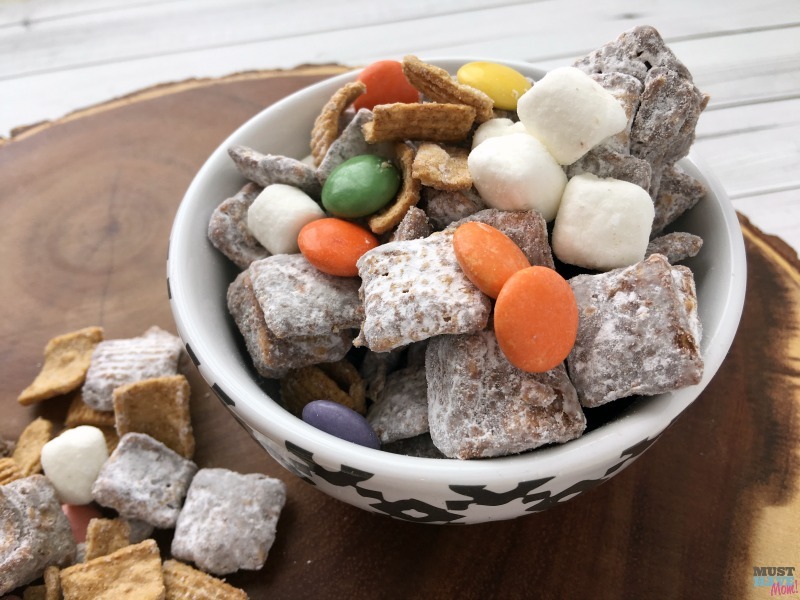 I’ll warn you before you even read any further on this Smores Nutella Puppy Chow Recipe…It’s ridiculously good, better than the original puppy chow recipe and it’s HIGHLY addictive! I made some two days ago and it was gone last night. I had 2 bowls and my family devoured the rest. It’s amazing and my son who hates anything with peanut butter loves that this is a puppy chow recipe without peanut butter. I initially went searching for a puppy chow recipe that doesn’t use peanut butter and came up with some results using soy butter instead. We tried it and it was good however my son still thought it tasted like peanut butter which he avoids with a ten foot pole so I searched again. I had an idea to make it with nutella since my son LOVES nutella. I found many nutella puppy chow recipes but when testing them out I found that they just didn’t work! The nutella would seize up and it wouldn’t spread. There were many fails in perfecting my own smores nutella puppy chow recipe. 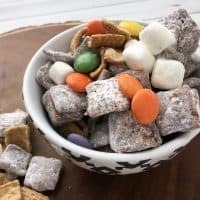 This is truly the only nutella puppy chow recipe online that is uniquely it’s own version that actually delivers a tasty nutella puppy chow! Trust me, I’ve tested them all! 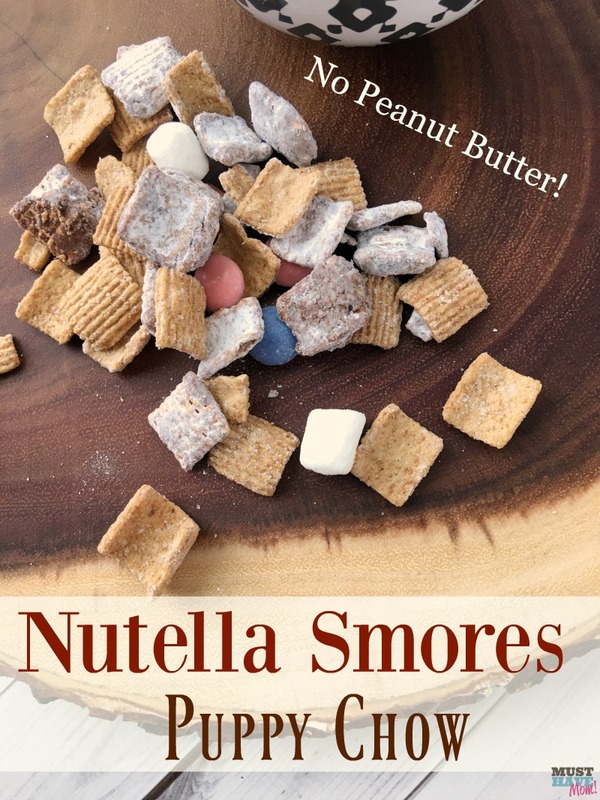 We went camping this past summer a TON and this smores nutella puppy chow was a staple on every one of those camping trips! We never tired of it. It’s easy, tastes out of this world and it disappears faster than you can say nutella. 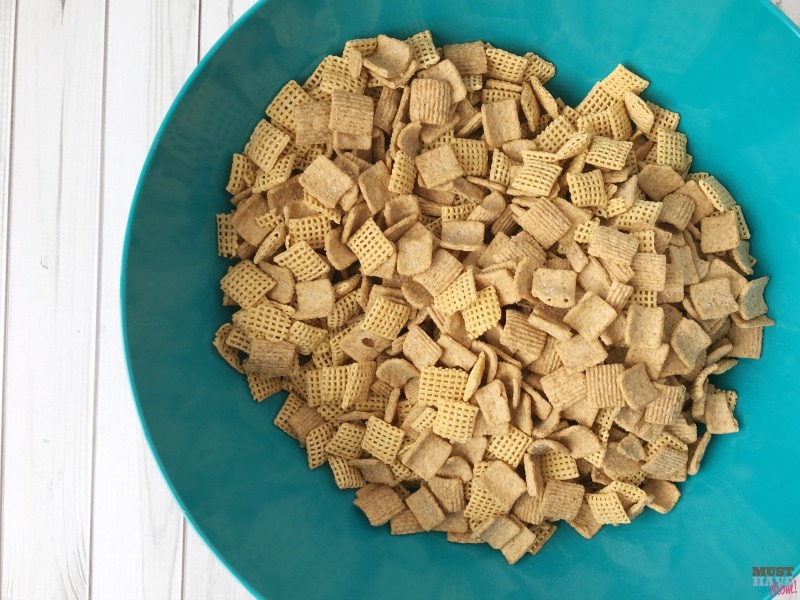 Begin by combining 4 cups of graham cereal and 5 cups of corn chex cereal in a large bowl, set aside. 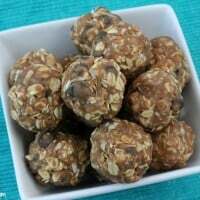 We try to eat as much non-GMO, chemical free food as possible so while this recipe is far from healthy I do have some tips woven in here to make it with food free from chemicals and GMO’s as much as possible! For the cereal I used this Cascadian Farm Organic Cereal – Graham Crunch to avoid chemicals and GMO’s. 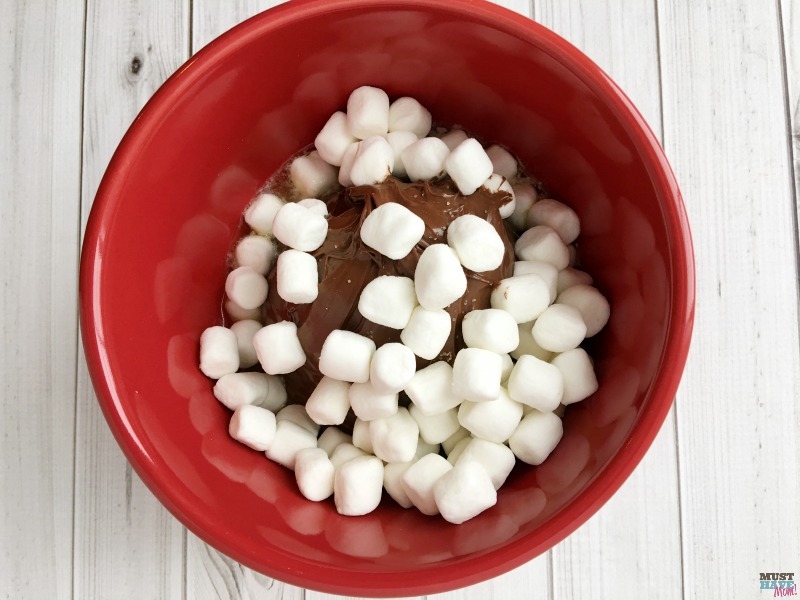 In a smaller glass bowl combine 2 Tablespoons melted butter, 1 1/2 cups nutella and 1 cup mini marshmallows. Microwave for 30 seconds (no longer or the nutella will seize up!). Remove from microwave immediately and quickly stir to combine. If you are like me and like to avoid GMO’s then do what I do and order the imported Nutella in glass jars from Europe. Since GMO’s are banned in Europe this Nutella is GMO free! Score! Immediately dump the nutella mixture over your cereal mix and stir to combine. This must be done quickly! Since you cannot microwave nutella any longer than 30 seconds without ruining the nutella, you need to work quickly while it is still warm or you will have trouble spreading it over the cereal. Mix until well combined like photo above. Put 1 cup powdered sugar into a gallon zip top bag. I use C&H pure cane powdered sugar to ensure it is GMO free! Now add half your cereal mixture to the bag, zip it shut and give it a shake! Once that batch is coated add the remaining cereal to your bag (leaving the first half in there as well) and add another 1/2 cup powdered sugar. Seal and shake until it is well coated. Next dump the powdered sugar covered nutella puppy chow into a clean, large bowl. 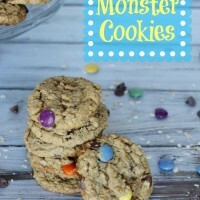 Add 2 cups graham cereal, 1 1/2 cups mini marshmallows and 1 cup chocolate candies or chocolate chips to the bowl and mix. We use these “Smarties” peanut free chocolate covered candies. They are like M&M’s only they are made in a peanut free facility. Store it in an airtight container. I have no idea how long it will keep because it never lasts longer than a couple days around here! This summer I made a triple batch for a ten day camping trip and it was gone halfway through our trip! Try it. I guarantee you’ll agree. 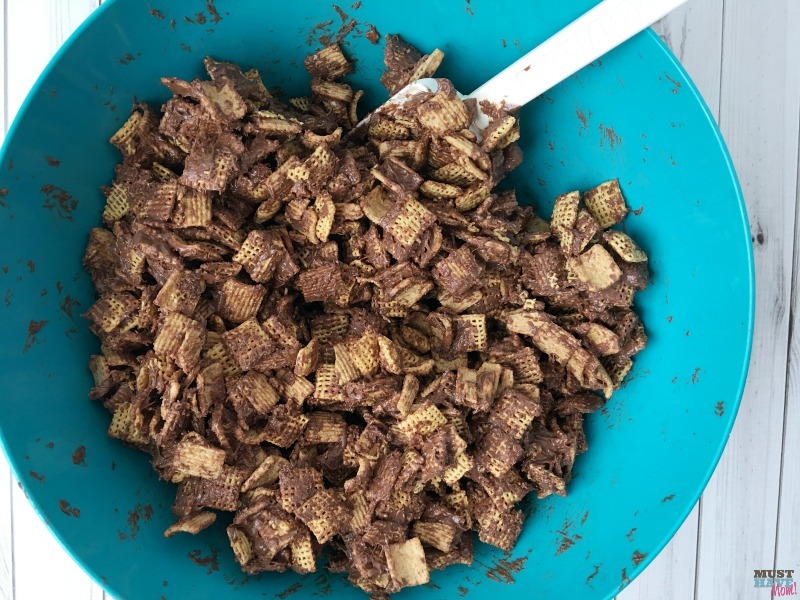 Scroll down to print off the nutella puppy chow recipe! Print off the recipe below! We love when you share our posts on Pinterest and Facebook! 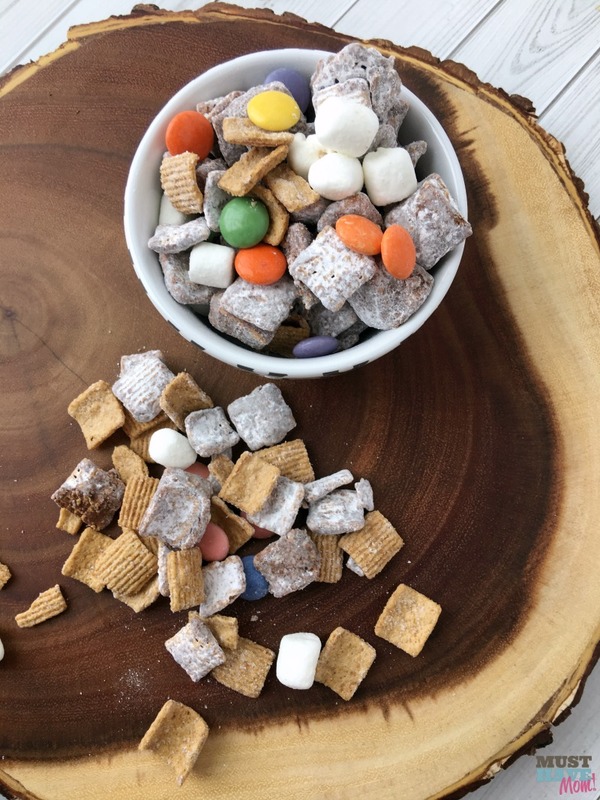 Quick and easy smores nutella puppy chow recipe that doesn't use peanut butter! Better than traditional puppy chow and is peanut free! 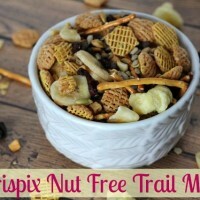 In a large bowl combine 4 cups graham cereal and 5 cups chex cereal and set aside. In a gallon zip top bag add 1 cup powdered sugar to the bag and set aside. In a glass microwave safe bowl (small size) combine 2T melted butter, 1 1/2 cups Nutella and 1 cup mini marshmallows. Microwave for 30 seconds (no longer or the nutella will seize up!). Remove immediately and quickly stir to combine. Quickly pour over cereal mixture and stir until well combined. This must be done quickly while the nutella is warm. Add half the batch of chocolate cereal mixture to bag containing powdered sugar. Zip shut and shake to coat evenly. Add remaining half chocolate cereal mixture to bag along with remaining 1/2 cup powdered sugar and zip shut. Shake until entire batch is evenly coated in powdered sugar. Dump puppy chow mixture into clean bowl. 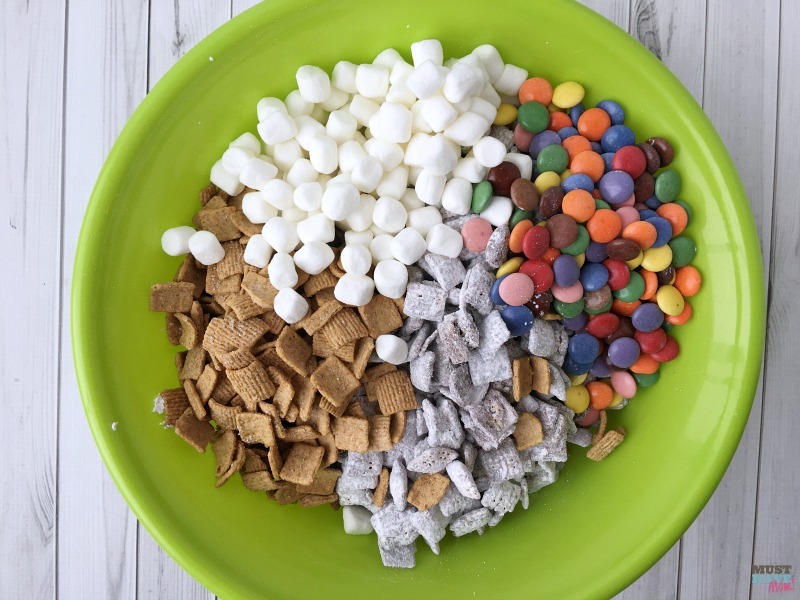 Add remaining 2 cups graham cereal, 1 1/2 cups mini marshmallows and 1 cup candy or chocolate chip pieces to bowl. Stir to combine. Store in airtight container. Oh boy, I will have to make this for my kids. I do a white chocolate mix at Christmas time that is SOOO good. But I have a hard time controlling myself when it is around, which is why I only make it once a year. This may be dangerous also! Yes, you may have to only make this one once a year. Maybe Christmas in July? Me too. Add some Nutella and I’m there. Now that looks lovely. I think the entire family will appreciate this as a delicious snack. This looks so yummy! I love Puppy Chow. I still have never tried Nutella yet I will have to make this. This Puppy Chow looks and sounds delicious. I love that it does not include peanut butter. Thank you for sharing.